These ladies (Aquin Fresh-Soph Volleyball and the Varsity bench) were a huge factor in the Lady DAWGS victory of the Bulldogs of Durand. To give you an idea of how loud they were . . . Aquin spectators were heard commenting that they felt like they were in St. Joe's gym! 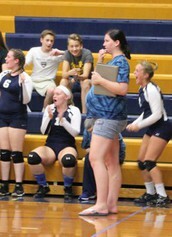 Read all about them--and the awesome play of the ladies on the court--in the Village Voices here: http://nwiaccess.com/news_main.php?newsid=1544&category=2 (or wait until Tuesday for the print edition). Check out photos of the game by clicking here. WAY TO GO LADY DAWGS--and THE DECIBELS! Coach Heck now has a new title . . . 'mom'! Yesterday at 8:23am, Coach Robyn Heck and her husband Ethan welcomed Elizabeth Renee Heck into their family. Elizabeth weighs 8'10 oz. and is 21.5 inches long. Welcome to the Aquin family Elizabeth! 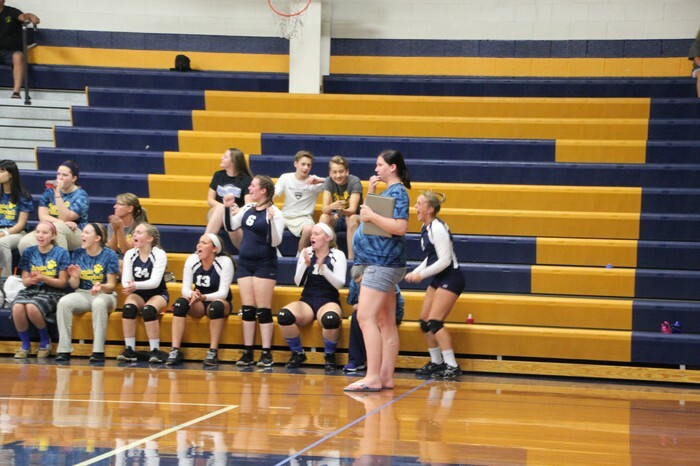 Luckily, Baby Elizabeth is used to the sounds above as she's already attended Aquin Volleyball games, as shown here last week--with the leader of 'The Decibels' right behind her!